NEW Organic Berry Complex with Antioxidant Vitamin C A powerhouse of antioxidants to help boost collagen and skin’s radiance This delicious, highly nutritious organic complex is bursting with organic acerola cherry extract, rich in vitamin C, antioxidants and phytonutrients to help boost your skin’s collagen production, support your immune system and give you antioxidant protection. Carefully blended with organic superfruits, omega fatty acids, vitamins and antioxidants, to provide a natural source of fibre and non-animal protein. 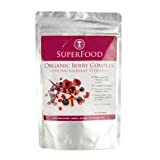 Organic Berry Complex is ideal for all the family, vegetarians and vegans.